Dry mouth is induced by dehydration of the oral mucosa, resulting from an imbalance of fluid supply and clearance within the oral cavity. Saliva is the major source of oral mucosal fluid, whereas oral fluid clearance includes evaporation and swallowing. Oral mucosal fluid absorption has been suggested to play a critical role in oral fluid clearance; over-absorption of water and ions across the oral mucosa under certain conditions may be a major component for oral fluid imbalance, leading to mucosal dehydration. While numerous studies have confirmed that the oral mucosa absorbs fluid and electrolytes, the pathways and mechanisms mediating the absorption remain undefined. The transcellular pathway regulating oral mucosal epithelial absorption includes aquaporins, epithelial Na+ channel and/or Na+/H+ exchanger, whereas the paracellular transport is likely to be mediated by tight junctions. The regulatory mechanisms of these pathways require further elucidation. It remains unclear whether the oral mucosa also secretes fluid and ions into the oral cavity. Although intercellular lipids secreted by epithelial cells form the major barrier to paracellular water and ion transport, the role and regulation of these lipids in oral mucosal hydration in physiological and pathological conditions need further investigation. Delineation of these mechanisms will be conducive to the development of preventive and therapeutic interventions for dry mouth. Objectives: To analyse the microbia composition of 10 healthy dental implants and 10 chronic periodontitis patients. Methods: Subgingival plaque and peri-implant biofilm were sampled at the first molar site before and after implant restoration. The analysis was conducted by 454-prosequencing of bacterial V1 to V3 regions of 16S rDNA. Results: Chronic periodontitis subjects showed greater bacterial diversity compared with implant subjects. The relative abundance of sixteen genera and twelve species differed significantly between implant and chronic periodontitis subjects. The genera Catonella, Desulfovibrio, Mogibacterium, Peptostreptococcus and Propionibacterium were present in higher abundance in chronic periodontitis subjects, while implant subjects had higher proportions of Brevundimonas and Pseudomonas species. Conclusions: Our results demonstrate that implant restoration changes the oral microbiota. The analysis suggests that periodontal bacteria can remain for a prolonged period of time at non-dental sites, from where they can colonise the peri-implant. Objective: To express the early prosthodontic treatment strategies for severe oligodontia patients with or without a syndrome and to share details of their experiences of the long-term follow-up. 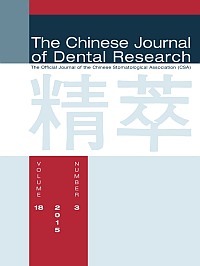 Methods: Patients with severe oligodontia (excluding the third molars, and with six or more congenitally missing permanent teeth) who had finished prosthetic rehabilitation between 2001 and 2014 and who had undergone at least 1-year follow-up at the Department of Prosthodontics, Peking University School of Stomatology were included in the study. The general and oral characteristics were determined and examined, interdisciplinary plans were provided, and the prosthodontic treatment conditions were described and evaluated. Results: In total 26 subjects were included. Twenty males and six females, whose first dental visit occurred between the ages of 2 years and 9 months old, and 31 years old were recorded, of which, 12 (46.2%) subjects had non-syndromic oligodontia and 14 (53.8%) had oligodontia with different syndromes. The number of congenitally missing teeth (excluding the third molars) was between 7 to 28 (mean = 18), with 14 and 21 teeth in the non-syndromic and syndromic oligodontia patients, respectively. Most of the patients accepted conventional prostheses and two had implant-supported crowns or bridges. The age of the first prosthesis delivery ranged from 3.5 to 31 years old. The follow-up period ranged from 15 months (1 year and 3 months) to 162 months (13.5 years), with a mean of 108 months (9 years). Conclusion: Early treatment for young patients and long-term follow-up greatly benefits patients. Interdisciplinary treatment ensures more satisfactory results. Objective: To explore the relationship between cone beam computed tomography (CBCT) measurements and direct measurements during the surgery to correct intrabony defects. Methods: Forty-four patients with 44 intrabony defects who finished initial periodontal therapy and were considered for periodontal surgery were recruited. Digital periapical radiography and CBCT was performed before the surgery. The distance from the bottom of the defect to the cementoenamel junction (CEJ-BD), the depth and mesio-distal width of the defect were measured on CBCT, periapical radiographs and during the surgery. The buccal-lingual width of the defect was only recorded on CBCT and during the surgery. Lastly, intra-surgical linear measurements were compared with measurements of radiographs and CBCT, respectively. Results: The means of the intra-surgical CEJ to BD, the depth of the defect, the mesio-distal (M-D) width and the buccal-lingual (B-L) width of the defect were 8.90 mm, 5.52 mm, 3.35 mm and 7.40 mm, respectively. Between CBCT measurements and surgical measurements the differences for the CEJ to BD (0.76 ± 1.40 mm) and the depth of the defect (0.63 ± 1.67 mm) were statistically significant, but the differences for the M-D width (-0.17 ± 0.67 mm) and the B-L width (-0.16 ± 0.65 mm) of the defect were not statistically significant. Conclusion: CBCT could provide relatively accurate measurements of the M-D width of the defect and additionally showed accurate measurements of the B-L width of the defect which periapical radiographs could not show. However, for vertical measurements of the intrabony defect (CEJ to BD and depth of the defect), when compared with measurements during the surgery, CBCT showed no advantages over periapical radiographs. A new method should be developed for accurately measuring the periodontal intrabony defects using CBCT in the future. Objective: To evaluate the development and risk factors of white spot lesions (WSLs) in orthodontic patients with fixed appliances in a Chinese population. Methods: A total of 202 subjects participated in the cross-sectional study. Clinical examination of the state of the entire labial (buccal) enamel surface was conducted under artificial light using a clinical mirror and an explorer. A face-to-face interview was conducted through a structured questionnaire to collect a range of information, including demographic data, family income, level of education, toothbrushing frequency, fluoride toothpaste usage and the use of a professional toothbrush (V type). Results: WSLs appeared on 57.9% of the subjects after orthodontic treatment with fixed appliances; the mean tooth number of WSLs was 4.8. A higher prevalence was observed in subjects whose time of therapy was 17 months or longer (OR = 3.2, P < 0.050), and who had modified their unhealthy dietary habits (OR = 3.7, P < 0.001). Younger individuals or individuals who consumed food with sugar at least once a day during the course of their orthodontic treatment also exhibited a higher likelihood of experiencing WSLs. Conclusion: The prevalence of WSLs after orthodontic treatment with fixed appliances was relatively high in China. Clinicians should be aware of the risk factors of WSLs that may occur during the treatment period. Objectives: To investigate the neutralising effects of subsequent urea rinse on sucrose-induced decrease in plaque pH with interdental plaque pH telemetry. Method: Six participants wearing partial lower prostheses which incorporated a miniature glass pH electrode were included. After 5 or 6 days of plaque accumulation on the tip of the electrode, the subjects rinsed with a 15 ml 10% sucrose solution, followed by no subsequent rinsing or rinsing with either 15 ml of water, 0.25%, 0.50% or 1.00% urea solution, for 2 min. The plaque pH was continuously recorded for 120 min. Results: Without subsequent rinsing, the plaque pH decreased at 10 min to 4.39 and stayed below the critical pH of 5.7 for 80 min following a sucrose rinse. Subsequent water rinse showed little effects on the sucrose-induced decrease in plaque pH, whereas subsequent urea rinses all immediately and effectively neutralised sucrose-induced decrease in plaque pH, and remained above the critical pH of 5.7 until the end of data collection. Conclusion: Urea rinse could effectively counteract the pH fall following sucrose administration. These results strongly suggested that the regular use of low-concentration urea rinse after carbohydrate consumption may help prevent caries. Objective: To compare the root canal morphology in the left and right mandibular premolars on cone beam computed tomography (CBCT) images. Methods: In this analytical cross-sectional study, 457 CBCT images, including human left and right mandibular premolars were evaluated. CBCT scans were investigated in the three spatial planes and differences in the number of roots and canals were recorded. Data were analysed using chi-square test. The significance level was set at P < 0.05. Results: From 914 mandibular first premolars, in the left side, 85.6% had one root and 14.4% had two roots; 69.6% had one canal and 30.4% had two canals. In the right side 87.3% had one root and 12.7% had two roots; 66.5% had one canal and 33.5% had two canals. There was no statistically significant difference in the number of roots (P = 0.440) and canals (P = 0.321) between left and right mandibular first premolars. From 914 mandibular second premolars, in the left side, 94.3% had one root and 5.7% had two roots; 77.9% had one canal and 22.1% had two canals. In the right side, 95.6% had one root and 4.4% had two roots; 83.4% had one canal and 16.6% had two canals. There was a significant difference in the number of canals between the left and right mandibular second premolars (P = 0.036). Conclusions: The root canal morphology in the mandibular left and right premolars was different, but there was a significant difference only in the number of canals in the mandibular second premolars.